One of the odd things about running a food website is that it means you get to celebrate each major holiday twice. This meant that Bets and I celebrated Valentine’s Day a week early so I could share the meal with all of you. Lucky you. We’ll do something else on the real V-Day that doesn’t involve going out to a restaurant because that is pure madness in my mind. I know that there are mixed feelings on Valentine’s Day and that is understandable. I’ve always sort of thought of it as a time to show thanks to those you care about. That could be a person that you are dating or married to, but could also be a roommate or you could just bring cookies into the office or something. When I used to live in a group house we would occasionally have a big Valentine’s Day feast together and it was always a lot of fun. We would make multiple courses and really live it up. I tried to replicate that this year except it was just for me and Betsy and our new cat Tipsy. It’s possible that I went a bit overboard for this meal. I wanted to test my skills at planning a full four course meal, cooking everything from scratch, and actually doing it all on time. I think I more or less succeeded. Over the next four days I’m going to share each course that I made and at the end I’ll give a little wrap up on the way I planned the meal. Fritters are delicious and not too terrible to make. I had to set up the frying station for a later course, so it wasn’t too much extra work. The only thing that made this recipe difficult was the pesky artichokes. I’m really not good at dealing with them. When Bets saw this recipe in the most recent Bon Appétit though, she let out a small yelp of excitement. So I knew they had to be on the menu. 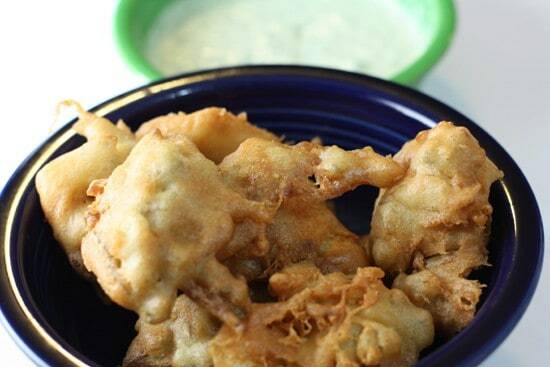 A first course appetizer featuring artichoke fritters with a green goddess dipping sauce. 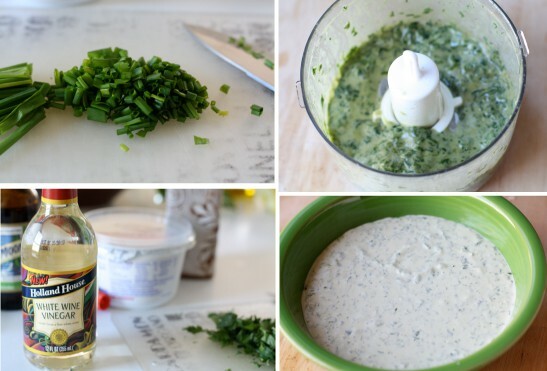 1) For the dipping sauce, mince herbs well and stir all ingredients together. Store in the fridge until needed. 2) For artichokes, first slice the top off of the artichoke and then cut off the stem. Leave about 3/4 inch of the stem. Then cut off all of the hard external leaves. Leave about 2 or 3 layers of fairly soft leaves. Also peel the stem part with a vegetable peeler or knife. 3) Then slice the artichoke in half and you will reveal the flower inside. Remove the inner parts of the artichoke with a paring knife. 4) Once you have it clean, set the choke on its top so its stem is facing straight up then slice it into 1/2 inch slices. Then soak in lemon water so the artichokes don’t brown. 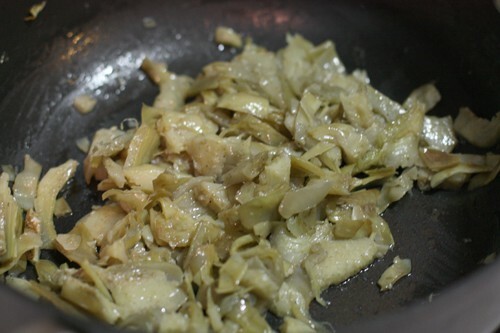 5) Add a tablespoon of olive oil to a pan over medium heat and then add your drained artichoke slices. Add about 1/2 cup of water and a good pinch of salt and pepper to the pan. Then cover and let simmer for about 10 minutes until the artichokes are very soft. 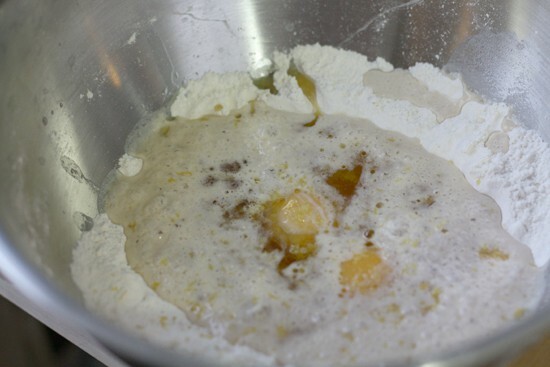 6) For batter, combine your flour, salt, egg yolks only, beer, and two Tablespoons olive oil in a bowl. Whisk it up at least 30 minutes in advance of frying. 7) Then take whatever your favorite deep-frying pan is and fill it up a few inches deep with canola or peanut oil. Something neutral. Heat to about 375 degrees Fahrenheit. 8) Meanwhile, whisk egg whites until they are fluffy, but not dry or stiff. Then gently fold them into your batter along with the artichokes. 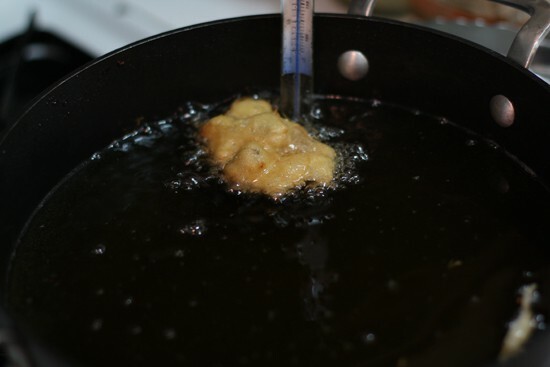 9) Do a frying test run with about a large tablespoon-sized fritter. 10) Fry until golden brown, 4-5 minutes in batches so as not to crowd the fryer. 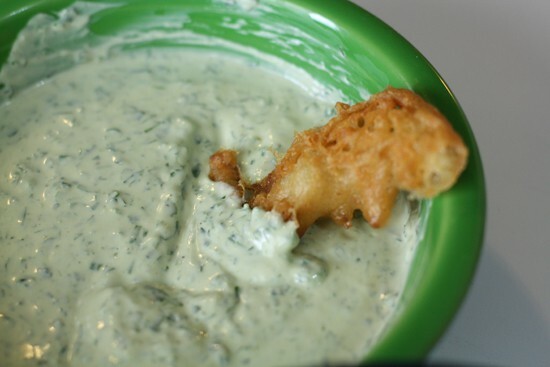 Once fried, drain on a paper towel and serve immediately with dipping sauce. You could make the sauce the day before if you wanted. It would keep fine. Now on to the fritters. Don’t even get me started on how infuriating BA’s instructions can be sometimes. If I would have followed their recipe exactly, I think it would have been a failure. It’s not that they say anything blatantly wrong (although I think 6 artichokes would have been complete overkill here), they are just very vague about preparation sometimes which is super annoying. Especially when you are dealing with what has to be the oddest vegetable out there – the artichoke. I’m not sure who figured out they could eat these things, but they must have been hungry. Let’s deal with them. Do one artichoke at a time and when you are done with it quickly put the slices in a lemon water bath. Otherwise they will brown horribly. First slice the top off of the artichoke and then cut off the stem. Leave about 3/4 inch of the stem. Then cut off all of the hard external leaves. Leave about 2 or 3 layers of fairly soft leaves. Also peel the stem part with a vegetable peeler or knife. Basically whittle it down to nothing. Then slice the artichoke in half and you will reveal the flower part of the thing. There is no easy way to do this but you have to get all of that stuff out. The easiest way that I have found is to get a paring knife and slide it all around the little fibers. You want to keep them mostly intact if possible. Then they should just sort of fall out. They won’t. But they should. Once you have it clean, set the choke on its top so its stem is facing straight up then slice it into 1/2 inch slices. After a soak in lemon water. Eventually you will end up with a bowl of artichoke slices. Unfortunately, you are not done. Now you have to cook these guys. 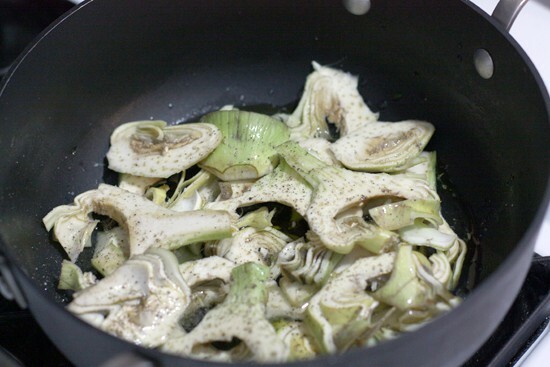 Add a tablespoon of olive oil to a pan and then add your artichoke slices. Drain them first. Add about 1/2 cup of water and a good pinch of salt and pepper to the pan. Then cover and let simmer for about 10 minutes until the artichokes are very soft. Done and sort of mushed up. You will want to make the batter at least 30 minutes ahead as it will need to rest. Basically, just combine your flour, salt, egg yolks only, beer, and two Tablespoons olive oil in a boil. Whisk it up. 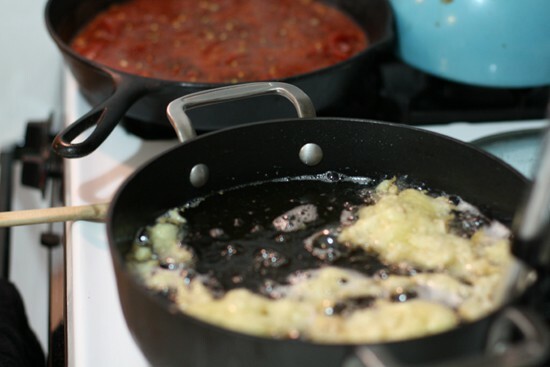 Then take whatever your favorite deep-frying pan is and fill it up a few inches deep with canola or peanut oil. Something neutral. You want to heat this to about 375. While that is heating, take your egg whites – you saved them right? – and beat them until they are fluffy, but not dry or stiff. 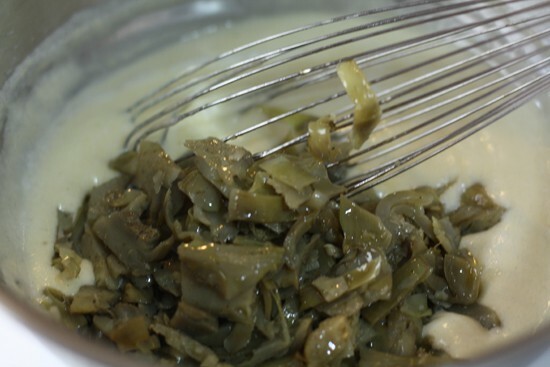 Then gently fold them into your batter along with the artichokes. I always like to do a test run to make sure everything is good. Fold together your batter and then scoop about Tablespoon sized drops into the batter. Be careful not to spray hot oil everywhere. Note the candy thermometer. They run like $6. If you are going through the trouble of making fritters from scratch – invest in one. See that sauce in the back? That’s for a different course. Betcha can’t guess. These guys only need a few minutes per side and then scoop them out onto a waiting paper towel to drain a bit. Serve while hot with the dipping sauce. This was the first course and they were very good. If only artichokes were a bit easier to work with. You could use the canned stuff maybe, but for this recipe, the fresh ones give a bunch more flavor I think. I think you could sub out the artichokes with Zucchini or something and still have very delicious fritters. A bit of a hassle no doubt, but they are delicious if you have the time. We snacked on this leisurely while we watched the cat attempt to touch every square foot of carpet in our apartment at the same time. Crazy cat. After this, you might want to check out the Second Course: Pear and Pecan Salad! Hum, I won’t be around to crash Valentines Day this year but it looks like it’s getting off to a delicious start!! Also, it’s okay that I wont be around this year because the 14th is more of a drinking holiday here in Bulgaria anyway. This is one of the recipes I bookmarked from this issue – I’m so glad you made it first, thanks for the tips! At 1st glance I wasn’t excited about this recipe. But after reading through & seeing your photos.. well, you’ve peaked my interest. Thanks for sharing. @ Karolinka. Pretty sure the 14th is a drinking holiday here also. I happened upon your blog via my friend posting your chicken soup recipe on her facebook page and must say I love your daily postings!! Your style of cooking is very similar to my own and the best part in my opinion is your dishes… yes your fiestaware!! I have a full collection and love seeing the dishes used in places other than my kitchen!! 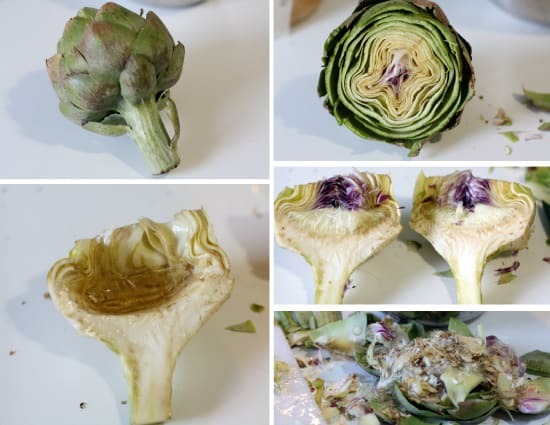 Now this recipe you posted today seems really yummy thanks for the breakdown of breaking down the artichoke I have always felt intimidated by them, but am thinking that I can make this recipe it looks delicious!!! Those artichoke fritters look yummy! oh my good lord they look good! that a good batter will make as it meets the ravenous bite of your teeth! @Veronica Fiestaware is my absolute fave. I think your girlfriend and I would get along, because those artichoke fritters had me drooling the moment I saw them. I knew I had to make them, and I will. Thanks for the tips about the ambiguity of BA’s instructions–I’ll have yours alongside when I make these!